Hal Greenberg: Legendary Bluffside Joins Castles & Crusades! TLG is proud to announce the return of a classic of the d20 era! Bluffside: City on the Edge! Bluffside: City on the Edge, first released in 2001, quickly took the RPG community by storm! A brilliantly compact city setting Bluffside brought a world of useful, fun information to table tops everywhere. TLG has worked out a deal with our old friends Hal Greenberg and Doug Herring to publish a full print version of Bluffside City on the Edge for Castles & Crusades. "Bluffside was my favorite d20 publication, barring Living Fantasy by Gary Gygax," remarked Stephen Chenault of TLG. This setting rolled out the print shop doors and landed right on my gaming table. It merged perfectly with Aihrde as presented in our own Codex of Aihrde (Erde at the time). Davis and I are both stoked see this classic join the ever growing list of Castles & Crusades titles." Hal Greenberg had this to say, "We (Doug and I) have taken a step back from game design for a while, what better way to come back then bring back one of our favorite projects for Castles and Crusades. We will be re-stating all of your old favorites and adding 12 new Places of Interest as well as designing 2 new NPC tables for their wealth and general reaction to your players for a quick and easy guide to make GMing in this city less stressful, easy and fun, which highlights some of the great features of C&C. We can not wait to hear the thoughts of the C&C fanbase once they get this giant city in their hands. For those that do not remember Bluffiside contains: new creatures, new races, dozens of new items and over 100 NPC's for the city to bring your campaign to life." 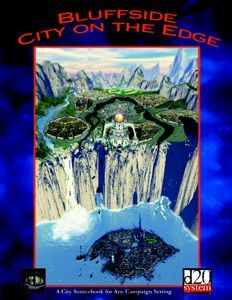 Hal Greenberg's own ground-breaking company Thunderhead Games originally published Bluffside: City on the Edge. In 2002 Thunderhead merged with Mystic Eye Games owned and operated by Doug Herring. Both veterans of the d20 wars bring all their flair and magic back to the gaming table.